Ceramics can be categorized into four major groups: structural (bricks, pipes, roof tiles, etc), refractory (kiln bricks, crucibles, etc), white wares (tableware, floor tile, sanitary ware, etc), and technical (nozzles, implants, bearings, etc). 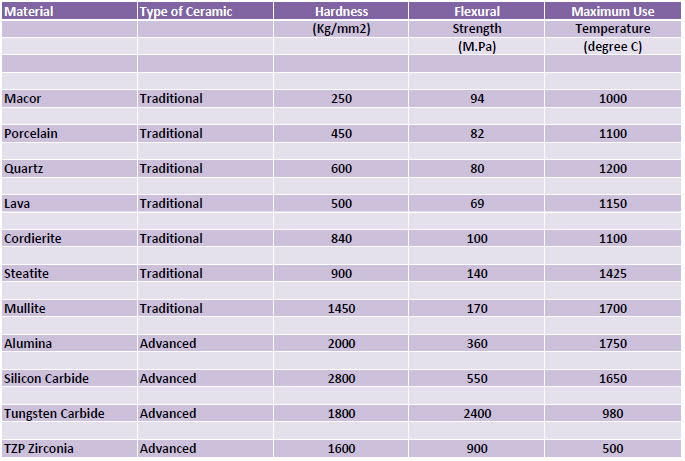 Generally speaking advanced ceramics are used to service the technical category. Advanced ceramics are produced using highly refined and purified powders that, in many cases, are synthetically produced using high temperatures or chemical reactions. When formed and sintered properly these powders result in product that are very strong, very high in abrasion resistance, can withstand high use temperatures, very good chemical resistance, and very stable. The table below illustrates some select properties of more traditional ceramics and several advanced ceramics for your comparison. As you can clearly see, advanced ceramics have created a whole new level of performance.